I wanted to write a little bit about something I feel is one of the most important pieces i’ve found – an original 1950s Browns Beach Vest. Few vintage clobber collectors get to see and touch, let alone own, a genuine, vintage Browns Beach vest or jacket. After literally years of watching everything Browns Beach come and go on eBay, seeing the prices that would bring a cuss-word under the breath of even a saint, this one popped up at a little over £200. Believe me, that may sound a small fortune if you are not familiar with Browns Beach cloth, but these usually go for more than double that, even older, more battered examples can go for nearly a grand!!! 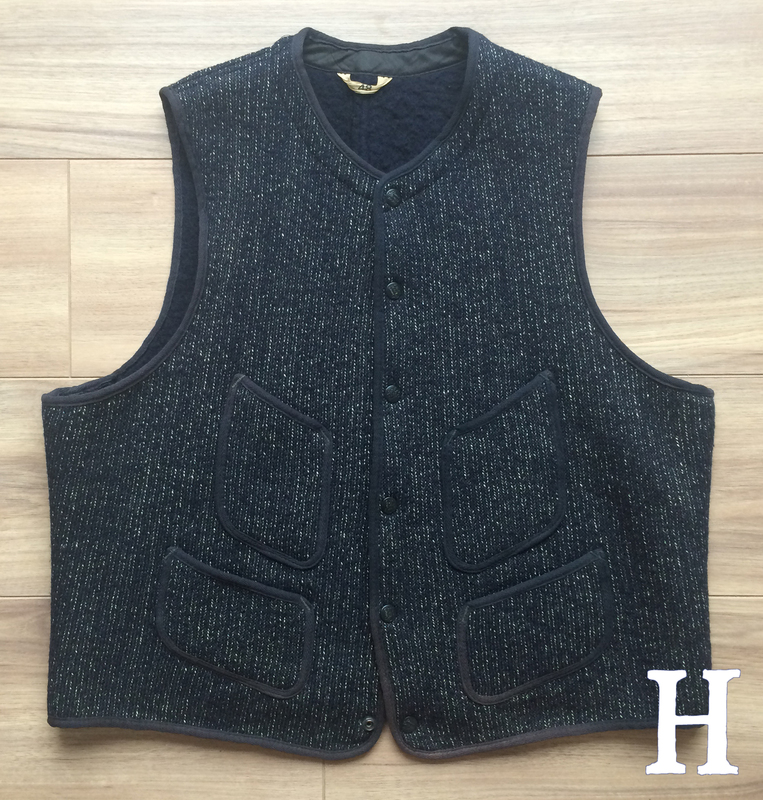 The stunning Browns Beach Vest. 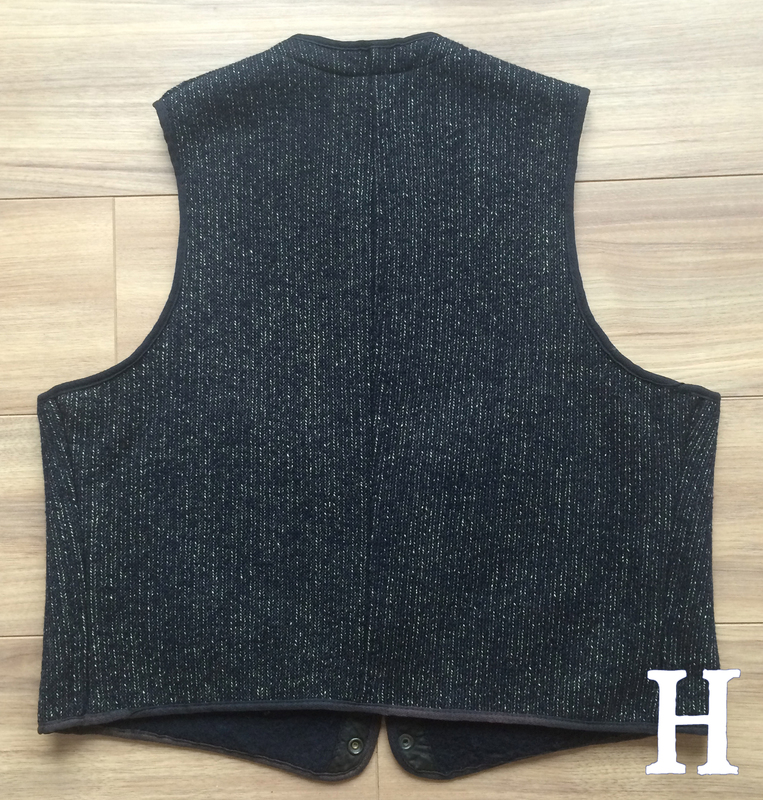 Rear view of the vest. Anyway, I checked the pictures, everything looked perfect barring a small amount of fading around the piping on the bottom left of the pocket and waist area. Size measurements were as a 48 chest, a bit on the large side, but I thought ‘damn, this is the one’, so pulled the trigger! When it arrived, the first thing I noticed was there was no smell – I was fully expecting to have to air this for a year before even bringing it near the back door. Its condition was fantastic. All the piping was great except for the faded areas I mentioned, but even then it was hardly noticeable. The beautiful salt and pepper fabric was unmarked, no pulls, stains, nothing. Bobbling to the inner wool had taken place but for it’s age this is to be expected. The press-studs/poppers all in tact and the logos on the black tops unmarked, this was truly an exceptional survivor. 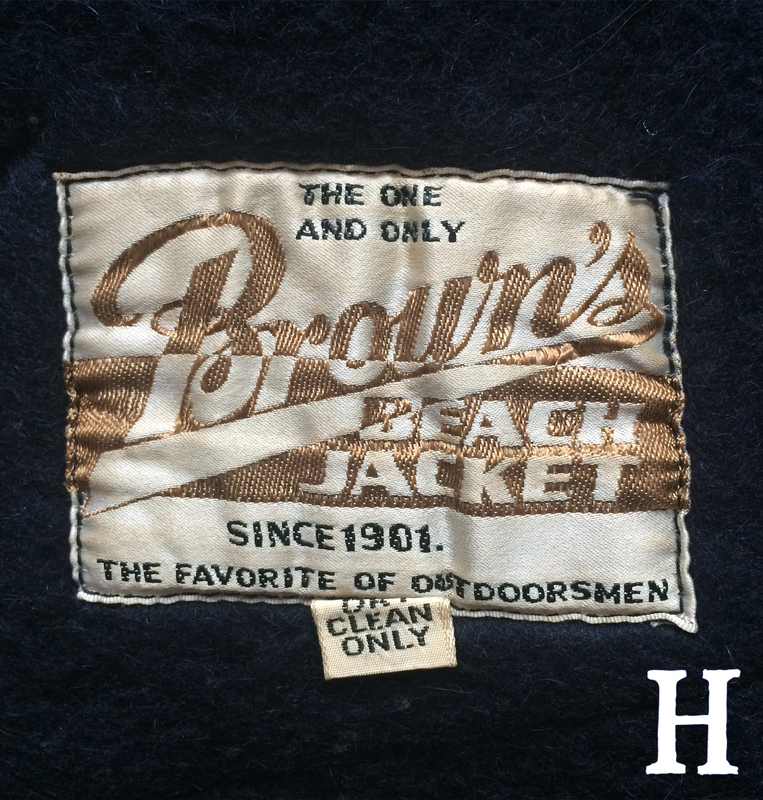 The button popper showing the Browns Beach Jacket logo and a close up of the cloth. Having owned a few reproduction Browns Beach pieces by some big names over time, the difference in quality with this original is massive. The cloth and its lining make for a really dense, reassuring thickness that makes you understand why they were worn in some of the toughest climates men could face. The fit is as it should be – short, it definitely needs a high rise pant with suspenders, low rise jeans and you’d look like one of the kids from Fame. I took it to be taken in by the only man I would trust with the ‘Holy Grail’ of workwear – The Denim Doctor, Michael Pendlebury in Manchester who pretty much does all my alterations. He respects the shape and finish on the piping doing an excellent job. The first wear out I team with my LVC 501XX 1933 Cone Mills jeans that have a great rise, Filson Suspenders and a RRL indigo dot print shirt. Just to finish, it really feels like wearing a piece of history. Everything is built so well, with purpose and perfection. Hopefully it will enjoy it’s old age with me, I get the feeling it has quite a long life left. Further reading on the history of this material should be done at my main point of reference for most things – the Vintage Workwear website. Unfortunately he doesn’t post too much nowadays but there is a LOT of really interesting stuff on there.